To close out 2016, we’re taking a look at some of the gear we think made a big impact among musicians this year. We’re not saying this gear was the “best” of the year, but whether they intrigued us personally or stirred up a bunch of discussion on forums and Facebook groups, this gear definitely made a splash in 2016, and may prove trendsetters in years to come. Check out our list below, and let us know your feedback in the comments section below! 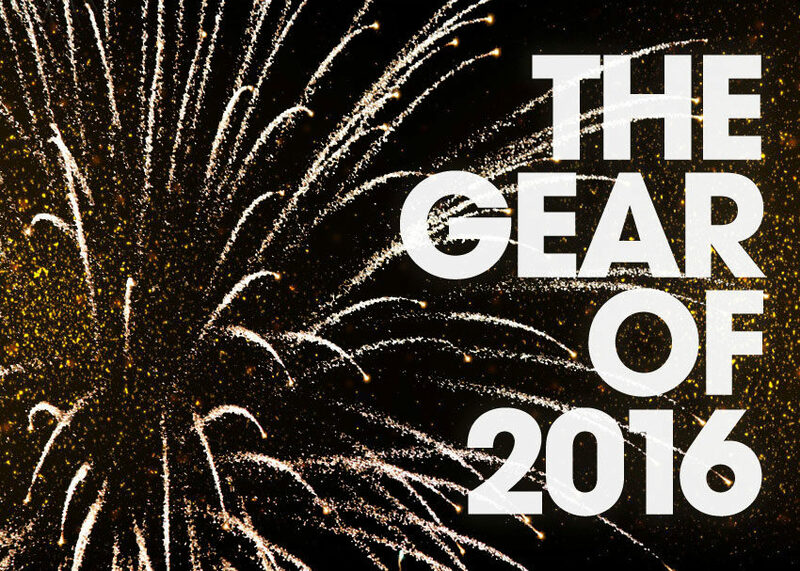 We want to hear what your favorite gear of 2016 was. 2016 was a year rife with opinions. From the presidential race to whether or not Kevin Durant signing with the Golden State Warriors was a weak-sauce move, it seemed there was nowhere to hide from the noise. As possibly the biggest name in electric guitars, Gibson is always in the conversation and its 2017 lineup was a big topic for guitarists. The most talked about axe in the shed? Without question, it was the new Firebird Zero. Looks-wise, it’s got the upside-down orientation of a Non-Reverse Firebird (wait, that’s non-reverse?) but with more dramatic curves a la the uh…reverse, standard Firebird. It’s familiar, but brings something new to the family, I’m getting a hint of that quirky Danelectro/DiPinto influence. Top that with pretty straightforward features like Double Slug humbuckers, wrap-around tailpiece, unbound rosewood fretboard and satin finish and OK, this looks like a good budget workhorse at $499. A Nashville-made Gibson for FOUR-HUNDRED AND NINETY-NINE DOLLARS?!?! Now you see what made this the most talked-about guitar on forums. But several early adopters gave it a chance, and with the reviews now in…it looks to be a winner! Owners praise the sleek neck and adjustable bridge. Gibson may have a new favorite in their lineup, and they’ve got a couple more budget bangers in their stable, like the SG Fusion, but will they continue in this range down the road? Only time will tell. Continuing a theme they introduced last year with their “10 for 15” series of unique, short-run guitars, Fender kept the bar set high in 2016 with the “Magnificent 7” series. I’m a sucker for offset guitars, so naturally my two favorite editions of the “Magnificent 7” series were the American Special Jazzmaster with Bigsby and the American Standard Offset Telecaster. To me, both of these guitars are essentially a modder’s dreams come true. What’s not to like about a Jazzmaster with a Bigsby? I know countless players who have immediately slapped Bigsbys on their Jazzmasters, so to have a factory issued model was pretty great. As for the Offset Telecaster, I’m honestly surprised it didn’t happen sooner. Boutique and homemade hybrids, usually referred to as “Telemasters” or “Jazzcasters” have been around forever, so I always assumed it was just a matter of time before Fender put out one of their own. With its maple neck and simple Tele configuration, its the official fairy tale marriage everyone was waiting for. I’m a sucker for few things in life. A gorgeous-looking, minimal, functional bit of design easily trumps many things I should be looking out for functionally-speaking. I’m not much of a guitar aficionado; instead I’m very utilitarian when it comes to guitars. But DAT Yamaha RevStar series THOUGH. If, I could get my hands on one of them, I might have to renege on my guitar idealism. Something I’m not at all utilitarian about though, are turntables. I want something that’s beautiful, functional, and minimally-designed. This will be quasi-furniture after all. If I’m being dead honest, no one knocked it out the park more this year than the get-it-while-you-can Akai BT500 turntable. With this model, Akai has brilliantly combined wood-and-metal, Danish design house looks with function in a legit, consumer-level turntable. What gets to me is that it’s dead-quiet (owing much to that gorgeous design) and rather than look too far back in musical time, it matches audiophile standard appointments with modern, grown-man needs like walnut finishes, wireless streaming, and USB connectivity. What can I say? Diego wants what Diego wants. Let me start by saying Maroon 5 isn’t really a band that ends up on my Spotify playlist too often, or ever, for that matter. When the Ernie Ball Music Man Valentine guitar showed up at zZounds HQ, after I got a look at it, I quickly put my personal music preferences aside grabbed it. While the guitar looks pretty basic at first glance, god is in the details, and it seems like Music Man spent a few years in seclusion at a monastery. The body shape is kind of a melding of a Les Paul Jr., a Tele, and an ES-335. If you squint, you might even mistake it for one of the custom Brian May guitars. Playing it, it’s a very comfortable feeling guitar and even has a very gradual body taper. It’s not something you really notice looking at the guitar, but once you wear it, you can feel it. The neck is made of a very cool-looking roasted maple that has been gunstock oil and wax hand-rubbed; a detail that sounds minor, but really adds a smooth, clean feel to the already super-fast 10″ radiused C-shaped neck. Being that it’s the signature guitar of a mainstream pop artist, I didn’t expect it to feel so smooth and fast. You can definitely shoot up and down the neck on some shreddy speed runs and not get stuck. The real heavy lifting is done by the electronics, though. The Valentine has a set of Ernie Ball custom pickups, with a single coil tele-style pickup in the bridge and a humbucker up by the neck. A push-push knob lets you split the humbucker for a total of 5 different pickup combinations using the 3-way toggle switch; a feature set that is becoming more and more standard on guitars. This all runs through an active preamp that lets you add an extra 20dB gain boost so you can kick it up for your solos, or boost your signal to push your amp into breakup. All in all, you have a wide range of tones that are easy to switch around from. Start off with some twangy Waylon Jennings leads, then flip a switch, push a knob and knock out your favorite T-Rex riffs. I even ran through a few Sabbath riffs without feeling like things got too thin. Ever since the original sE Reflexion Filter first made waves over 10 years ago, microphone reflection filters have been a home-studio mainstay. Their design hasn’t changed much since then, but the Aston Halo offers a breath of fresh air. Aston released their Origin and Spirit mics in 2015, turning many heads in the extremely crowded marketplace of inexpensive large-diaphragm condenser mics. Now with 2016’s Halo, they’re poised to do the same in the equally crowded field of reflection filters. Fender previewed their new Offset Series of guitars and basses to the public at Summer NAMM back in June and we were convinced from the get-go that they’d be a huge hit. Included in the series were updated versions of both the Mustang and Duo-Sonic guitars, as well as a revamped Mustang Bass. Sporting short scale lengths, Fender’s Mustang and Duo-Sonic models started their existence as student models in the middle of last century. Both were eventually relegated to pawn shops by the late ’70s — only to be picked up at bargain prices by aspiring artists who needed a dependable instrument on a shoestring budget. After the independent music explosion of the ’70s and ’80s, these student models were eventually seen on some of the biggest stages in the world. Players like David Byrne, Kurt Cobain, and Liz Phair brought these instruments to the mainstream, cementing their legendary status. As a result of their new-found prominence, the once-affordable Duo-Sonics and Mustangs (in particular) started commanding premium prices on the vintage market by the end of the ’90s. The Offset Series introduced in October is Fender’s answer to the increasing demand for these incredibly cool instruments. Controls have been streamlined, reflecting the no-nonsense attitude of the punk and indie community — pick up the guitar, plug it in, and play it loud. Fender also introduced different pickup combinations, such as a coil-tappable humbucker in the Duo-Sonic HS model, and hotter P90 pickups in the Mustang 90. The Mustang Bass has also been updated with a combo of P- and J-Bass pickups for increased versatility. Overall, this lineup has been one of my favorite releases from Fender in 2016, and at $499.99 ($549.99 for the Mustang Bass), these instruments should fit in the budgets of today’s future stars. EQD really changed the DSP-based delay game this year with their Avalanche Run Stereo Delay Reverb pedal. I’ve owned and test-driven quite a few high-powered digital delay/reverb pedals in my day and Avalanche Run is by far the most user-friendly and creative. One of the coolest features of this pedal is the expression jack. External expression pedal compatibility has become more of a thing with effects the past few years, but Avalanche Run really took it to the next level by allowing you to assign the expression jack to one of six different controls via a rotary “EXP” selector switch. But wait — there’s more! The other unique thing I found with this pedal is all the hidden features of the normally simple tap tempo switch. Not only can you control the delay ratio via a second rotary selector switch, but you can also essentially self-oscillate the pedal while in “normal” or “swell” mode by holding down the tap tempo switch. If you’re in “reverse” mode, holding down the tap tempo switch will temporarily flip you back into “normal” mode. Pretty neat, huh? I’ll remember 2016 as the year that brought FM synthesis back in style. In spite of the cries of its demise by analog and modular purists, people were rediscovering the treasure trove of music and sound that can be made from clean, digital frequency modulation. Frequently misaligned and misinterpreted, the faint call of loyalists who had been ignored for so often finally got some answer in the form of two brilliant reintroductions of that crystalline sound. My favorite of them all was Korg’s diminutive volca fm, a synth so concise in its aim to make operating with operators as straightforward, or bugged-out as possible. The volca fm allowed both young kids riding vaporwaves to have as much fun as older gents/gals who began their FM love affair with a different kind of wave: New Wave. As for myself, there’s just something about its percussive qualities that no other kind of synthesis can touch, and having this much architecture in such a box (and at such a price!) still strikes me as beyond amazing. Everyone knows multi-tracked guitars sound awesome. Whether on leads or rhythm, doubling, tripling, or beyond-ing a guitar track not only helps thicken it up, but adds texture. Because unless you’re part-android, you’re not going to play a part exactly the same twice. The popular studio technique is difficult to recreate live, however. Whether through sutble chorus, quick slapback delay, stereo amp setups or a combination of all three, guitarists have tried — with varying degrees of success — to recreate a multi-tracked sound, but have all come up at least a little short. Not anymore. The MIMIQ Doubler gives players the option to add 1, 2, or 3 overdubs to their dry sound. With blending controls for your dry and wet signal, you’ve already got a lot of customization potential here, but TC takes it a mile further with the “Tightness” control. Here, you can adjust how tight (accurate) the overdubs are to your original line, or how much variation they have. You can even send your signal out to two amps via stereo outputs! And yes, there are other pedals out there that do artificial double tracking (ADT), but those are often high-end or boutique models. TC Electronic brought the power to the people with the MIMIQ. Known for their strings and other guitar accessories, Ernie Ball’s only previous entry into the guitar effects arena had been their series of popular volume pedals. That is, until 2016, when they released two very distinct effects: the Expression Overdrive and the Ambient Delay. If you’ve ever owned one of their volume pedals, you know that Ernie Ball builds them like tanks, and these pedals are definitely cut from the same cloth. One of the coolest features that sets these pedals apart from other overdrive and delay pedals, is the fact that you never lose your dry signal. After setting the controls to your preferred tastes, you simply use the expression rocker to mix in the wet signal. With your heel all the way down on the pedals, you get your regular dry signal. As you move the rocker toward the toe-down position, you’ll hear the wet signal mix into your sound. This method of adding effects to your signal is quite imaginative, and definitely allows room for you to make some rather creative choices with your guitar’s tone. The Expression Overdrive offers natural tube-like distortion that fits well with any genre and on any rig. Controls include your standard Drive and Tone, but the pedal also incorporates a Boost knob that gives your signal an extra +6dB kick in the toe-down position — great for when you need that little push over the cliff for your most hair-raising solos. The Ambient Delay combines a digital delay with plate reverb for which to easily create lush soundscapes. Use the expression pedal to keep your delays and reverb in the background, or go in the full toe-down position to make the ambience the star of your show. The delay even includes a jack for an optional tap tempo. Given that these are the first real effects pedals Ernie Ball has made, they really knocked ’em out of the park. You might be surprised to find PreSonus’ StudioLive AR series of mixers in a list of the hottest gear of the year. Compared to their ubiquitous larger siblings — PreSonus’ StudioLive digital consoles and stageboxes — the little AR8, AR12 and AR16 mixers may not seem very high-tech. Yet, the PreSonus StudioLive AR series took home a Best in Show award at Summer NAMM 2016. Here’s a look at what sets these unassuming, utilitarian mixers apart from the pack, and how you might use one in your rig. The smallest StudioLive AR mixer, the AR8, fits in a 12″ x 12″ footprint. PreSonus saved space by using knobs instead of faders, which ought to work just fine for most set-it-and-forget-it setups. The larger AR12 and AR16 do have 60 mm faders (and, obviously, more channels and buses), and the option of a 19-inch rackmount kit. On all three mixers, you’ll find PreSonus’ Super Channel. “Super Channel” may sound like a gimmicky name, but it’s a real problem-solver of a channel that accepts any of 5 stereo sources: the RCA or 1/8″ TRS analog inputs, the built-in SD card slot, USB playback from a computer, or streaming audio from a Bluetooth device. If you need to play a file on your phone over the PA, you can pair it to the mixer’s Bluetooth receiver without fiddling with an adapter cable. Plenty of compact mixers have a 2×2 USB audio interface; you may have used one to record a stereo mix to (or play back stereo audio from) your computer. As USB audio interfaces, the StudioLive AR mixers give you more generous I/O: the AR8 is 8×4, the AR12 is 14×4, and the AR16 is 18×4. That means you can plug a USB cable into your computer, and record all your inputs on individual tracks. And yes, PreSonus includes a 6-foot USB cable in the box. Not only can you multitrack-record each channel over USB, you also get 4 channels of USB playback. PreSonus groups those USB playback channels into two stereo pairs, creatively named 1/2 and 3/4. By default, USB 1/2 will play back on the Super Channel, while USB 3/4 will play back on the channel just left of the Super Channel on the board. Two stereo playback channels are a must if you’re a digital DJ — you need that “cue out” from your DJ software in addition to your “main out.” An extra pair of playback channels gives you more flexibility in the studio, too: you could use your DAW software to send two separate headphone mixes out on 1/2 and 3/4. In a live situation, you could even use those four channels of playback to send a click track to the Monitor bus, which could feed your in-ears, while sending a backing track to the mains. The mind boggles. The real “killer app” on these mixers is the built-in SD card recording. Press a button to capture your show or band practice to an SD card. If you were thinking about picking up a portable recorder and a mixer, you now can kill two birds with one stone. Actually, three birds: it’s an SD card recorder, a compact analog mixer for live gigs, and an inexpensive USB audio interface for your home studio. Metallica guitarist Kirk Hammett and metal scene veteran David Karon teamed up a few years ago with the intention to “make guitar effects they would use, love and be proud of.” With a first batch of five pedals under their belt, KHDK is clearly focused on quality, not quantity, and the Scuzz Box really helps proves this point. Sure, it’s another fuzz pedal, and these days those are a dime a dozen. The circuitry is relatively simple, and seemingly every pedal brand has a few variations in their roster. Meanwhile, countless independent soldering wizards have whipped up their takes on old classics. As someone who plays a lot of heavy music, fuzz pedals are my thing, and a lot of the ones I’ve tried out have either never quite sounded thick enough, or are just a one-trick pony only usable if you stay in their (usually small) sweet spot. The germanium-voiced Scuzz Box, though, is definitely one of the most usable fuzzes I’ve tried. With the Fuzz control all the way down to zero, you start off with a nice crunchy overdrive. Start dialing the knob up and you roll into classic ’60s psych-rock-style gritty and nasally fuzz. But the real fun happens when you flip over the Scuzz setting. It turns the pedal into a splatty, velcro-y fuzz that bites and snarls under the wall of fuzz wash. I’ve played plenty of pedals that venture into this velcro-style fuzz region but end up treading too far out into open water and get lost in unstable, uncontrollable cracking and popping. The Scuzz Box walks right up to the edge without going over. Also, a feature you’ll appreciate if you run a larger board is the built-in buffer which combats the unwanted oscillation that you may incur with a bunch of effects placed before it. And like all buffered pedals, it helps eliminate signal loss in long pedal chains.